Spin This: "Lonely," "Take the Long Walk Home"
You may be pondering the real meaning behind the usage of 2.0. If so, you may want to accept this quick factoid, that it’s a fad-like technological software term used to describe a second edition of something. 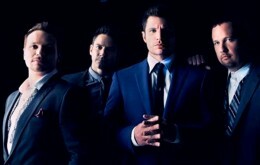 Nick and Drew Lachey, and their two singing partners, are returning to the musical forefront after a thirteen-year bout of silence, thanks to a long overdue tour uniting the best boy bands of the Nineties. And with their return comes their first realized album in year, aptly titled 2.0. 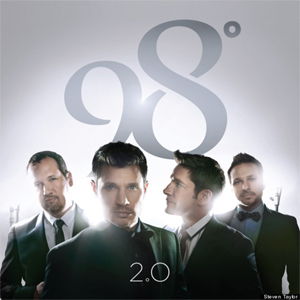 Although 98° – the band’s debut album – is far removed from our conscience, not because it’s a dated disc but because of the long-term forgetfulness that plagues the typical one-generation boy bands, the choice to coin this album 2.0 could be considered the next level of music for them. We aren’t exactly sure if label marketers are trying to slyly brand the 2013 disc as a reinvention of version 1.0., but it does seem as if the R&B-loving foursome are trying to recapture their muse. The album dances in a world of nostalgia, while trying their best to stay relevant in the modern times as if they are trying to satisfy label obligations. “Microphone,” the album’s opening track, is their first contribution to the sound of now, as it plays with Enrique Iglesias electro pop on “Microphone” while using The Sound of Music theories. Sadly, they couldn’t develop a better lyric to follow “hey lady, grab the microphone.” (‘And say Do-re-mi-fa-so-oh-oh-oh” is what follows). “Girls Night Out” sprinkles Usher-ish night club magic inside its familiar beats; it works for them even if the “so many women” phrase sounds generic. When 98° departs from default pop is actually where they quickly discover what works best on them. “Lonely,” penned by Ne-Yo and Chuck Harmony, allows the pipes of Nick Lachey and Jeff Timmons to soar like confident soul men. It’s a better ballad then what Harmony and Ne-Yo has been dropping as of late, as if they knew what would properly fit on them. Bruno Mars even drops a Prince-ish slow jam on them (“Take the Long Way Home”), showing off their best Maxwell-like falsettos. There’s enough room for them to experiment, cautiously playing with Off the Wall grooves (“Can’t Get Enough”), modern adult-contemporary rock (“Impossible Things”) and old-school soul (“Agree on Goodbye”). But the music here isn’t groundbreaking, nor is it the kind that dominates a Top 40 playlist. If anything, devout fans will see this as a welcoming chapter in their discography. To others, it’s just a fairly decent collection of color-by-numbers pop – just enough to get them past the hurdle of not being lost to the winds of time.